Listen, and show respect for the elders! 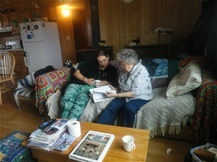 On Monday, 12 March 2012 has passed away from us Catherine Attla , storyteller from the KoyukonAthabascans . This news has deeply touched me . Her lessons will live on in many hearts..I am grateful that I have known her and for her wisdom that I have received . The lesson I learn now is that you always must be vigilant in life .. before you know you wander off , you wander off the path that your soul wants to follow. And then you miss precious moments. If I had listened to my dreams .. to what I felt and saw ... then I had more time spend with Grandma Catherine . Then I had made other choices. Now I cannot change something about this but what I can do is accept this lesson.Daily we make small steps... andespecially those small steps are so important..Make them aware..every time...questionable whether these mall steps, the littledecisions you make daily to match the path that you want to follow...whether they fit with what you truly want to be.. and when you feel resistance..ask yourself why ...and listen to it ...the way to the goal,is just as important as the goal itself. I will continue my path ... more conscious, with more and more attention. I remember the last words of Catherine very well ... '' I love you '' ... that is what she said when I was leaving Alaska...beautiful last words to remember..Her medicine -bag that I received and I often wear gives me strength. And that angel that she gave me as protection.........that angel is Catherine….. Here are 2 links for those who want to know more and hear from Catherine Attla . I will miss you but I know that you are in my heart always with me..
Great website Teekkona, have a safe journey. Ik ontving een mailtje van je met de link naar deze tekst. Mooie dingen heb je erbij geschreven. Ik krijg er tranen van in m'n ogen.